Staffan De Misutra, the UN Special Envoy for Syria (on screen), briefs the Security Council on the situation in the country. Briefing the Security Council on his meeting with the Syrian Foreign Minister, held in Damascus on Wednesday, Staffan de Mistura said that an impasse had been reached over a proposed new constitution for Syria, with the UN playing a major role, as directed by the Council. The veteran envoy, who recently announced he would be stepping down at the end of next month, said that the sticking point revolved around the Syrian leadership’s view that constitutional reform, was an internal matter. 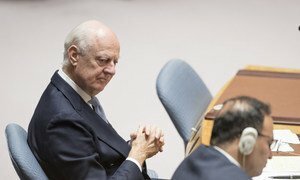 The key sticking point, Mr. de Mistura told the Council, was over the so-called “Middle Third List” of 50 names that the UN is backing to serve on a Constitutional Committee, to create a more democratic post-war Syria. He said the UN was not opposed to “constructive and moderate suggestions” so long as “spirit of credibility, balance and international legitimacy of the Middle Third List is maintained,” he said. “It is important to ensure the minimum 30 percent [participation of] women in the constitutional committee and this requires at least 24 out of the 50 in the Middle Third List to be women,” stressed the UN negotiator. The Middle Third List refers to a third of the delegates to the constitutional committee, representing Syrian experts, civil society, independents, tribal leaders and women. The other delegates would be drawn from the Government and opposition. He further said that Minister Moualem proposed that the suggested list, which was drawn up by the UN in consultation and with inputs from all actors, be withdrawn. 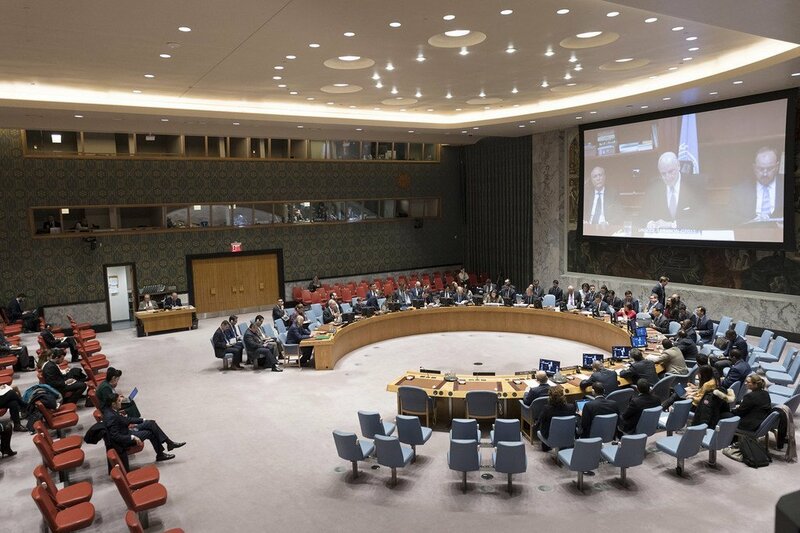 Mr. de Mistura reiterated that the UN “could withdraw” its proposal, only if there is an agreement on a new credible, balanced and inclusive list, consistent with Security Council resolution 2254 and final peace talks led by Russia, Iran and Turkey. In response, the Minister indicated that he would get respond after instructions from the Syrian leadership and that the Minister “preferred at this stage” to await the outcome of the UN Special Envoy’s upcoming consultations with the Astana Guarantors, said Mr. de Mistura. Addressing the Council in New York via tele-conference from Lebanon – he told members he would also brief the Presidents of France, Germany, Russia and Turkey, in Istanbul, on Saturday, on the latest developments.